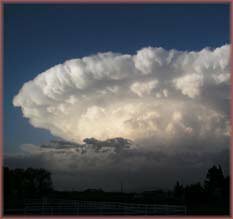 Hail is formed in huge cumulonimbus clouds, commonly known as thunderheads. When the ground is heated during the day by the sun, the air close to the ground is heated as well. Hot air, being less dense and therefore lighter than cold air, rises and cools. As it cools, its capacity for holding moisture decreases. When the rising, warm air has cooled so much that it cannot retain all of its moisture, water vapor condenses, forming puffy-looking clouds. The condensing moisture releases heat of its own into the surrounding air, causing the air to rise faster and give up even more moisture. Cumulonimbus clouds contain vast amounts of energy in the form of updrafts and downdrafts. These vertical winds can reach speeds over 176 kilometers (110 miles) per hour. 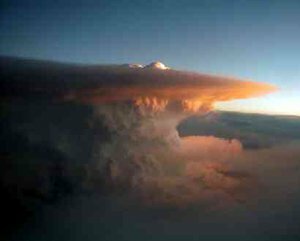 Hail is formed in the storm cloud's main updraft, where most of the cloud is in the form of "supercooled" water. This is water that remains liquid although its temperature is at or below 0 degrees Celsius (32 degrees Fahrenheit). At temperatures higher than -40 degrees C (-40 degrees F), a supercooled water drop needs something on which to freeze, or it remains liquid. Ice crystals, frozen raindrops, dust, and salt from the ocean are also present in the cloud. On collision, supercooled water will freeze onto any of these hosts, creating new hailstones or enlarging those that already exist. Cross sections of hailstones often reveal layers, much like those of an onion. These layers are caused by the different rates of accumulation and freezing of supercooled water, as the hailstone forms. When there is a great deal of supercooled liquid in the air through which the hailstone falls, water accumulates faster than it can freeze, so a coat of liquid forms. This becomes a layer of clear ice when it does freeze. When a hailstone falls through air with a smaller amount of liquid, the liquid freezes on contact with the hailstone, forming small air bubbles in the opaque layers. The more supercooled water a hailstone makes contact with, the larger and heavier the stone is likely to become. When the hailstone becomes so heavy that the updraft can no longer support it, it falls from the sky. Hail is formed along paths scientists call hail swaths. These vary from a few square acres to large belts 16 kilometers (10 miles) wide and 160 kilometers (100 miles) long. Swaths can leave hail piled so deep it has to be removed with a snow plow. In Orient, Iowa, in August 1980, hail drifts were reported to be 2 meters (6 feet) deep. 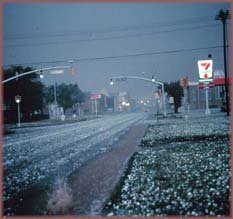 On 11 July 1990, softball-sized hail in Denver, Colorado, caused $625 million in property damage, mostly to automobiles and roofs. Forty-seven people at an amusement park were seriously injured when a power failure trapped them on a Ferris wheel and they were battered by softball-sized hail.